THURS 3 SEPT 8.00 pm – ‘Sharing the Gospel!’ Public meeting, all warmly welcome! 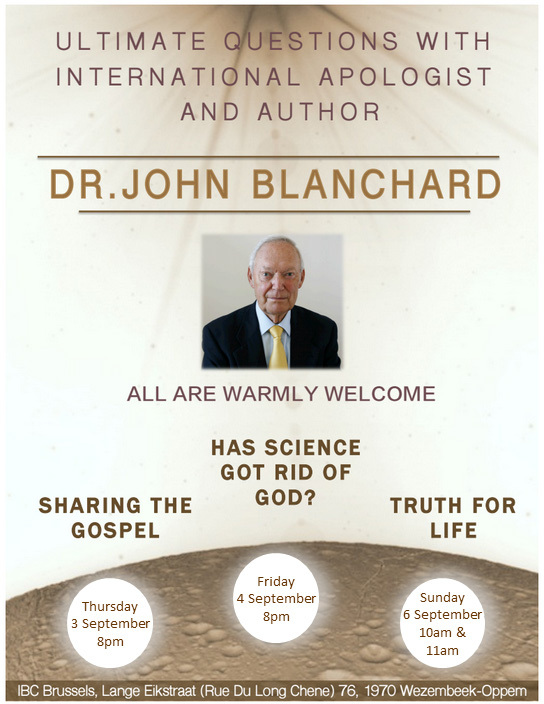 FRIDAY 4 SEPT 8.00pm – ‘Has Science Got Rid of God?’ Youth and all-age meeting, all warmly welcome! SUNDAY 6 SEPT 10.00am ‘What in the World is a Christian?’ (before the Worship Service), all warmly welcome! SUNDAY 6 SEPT 11.00 am – ‘Truth for Life’ Worship Service, all warmly welcome! Next Post Learn English at IBC!